Detect dead pixels on LCD displays. Is there a better alternative to Pixel Tester? Is Pixel Tester really the best app in Desktop category? 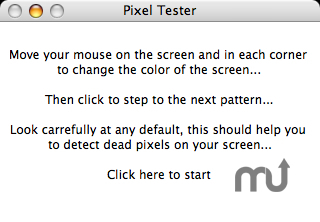 Will Pixel Tester work good on macOS 10.13.4? You can test all possible and existing colors on your screen simply by moving the mouse, which is fun, simple and fast. It is available in Dutch, English, French, German and many other languages.